With this webinar, we hope to show industry professionals just how this Special Controls trend has picked up pace, and what it means now and going forward. 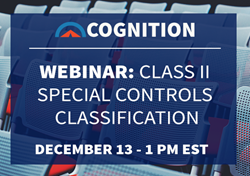 Cognition Corporation, a software company specializing in medical device compliance and commercialization, is hosting an end-of-year webinar focusing on Class II Special Controls device classifications. The webinar on December 13 will discuss recent trends in Special Controls classifications, the ways in which those trends impact medical device product development, and practical examples in the industry today. Class II Special Controls classifications offer explicit guidance for certain types of Class II devices based upon safety concerns. When a device falls under this classification, FDA looks for “reasonable assurance of safety and effectiveness” when insufficient evidence is available to establish general controls. “It’s very interesting, what we’re seeing when it comes to these types of classifications,” says Larry Nicholson, Director of Business Development at Cognition. Nicholson, who will lead the webinar, has conducted extensive research and analysis on the world of Class II Special Controls. This webinar is the next of a series featured by Cognition. Every month, members of the Cockpit Crew host public sessions discussing the latest trends in the medical device, pharmaceutical, and combination products industries. “With this webinar, we hope to show industry professionals just how this Special Controls trend has picked up pace, and what it means now and going forward,” says Nicholson. Spots are limited, so Cognition encourages everyone who is interested in attending the December 13 webinar to sign up soon. Click here to register.